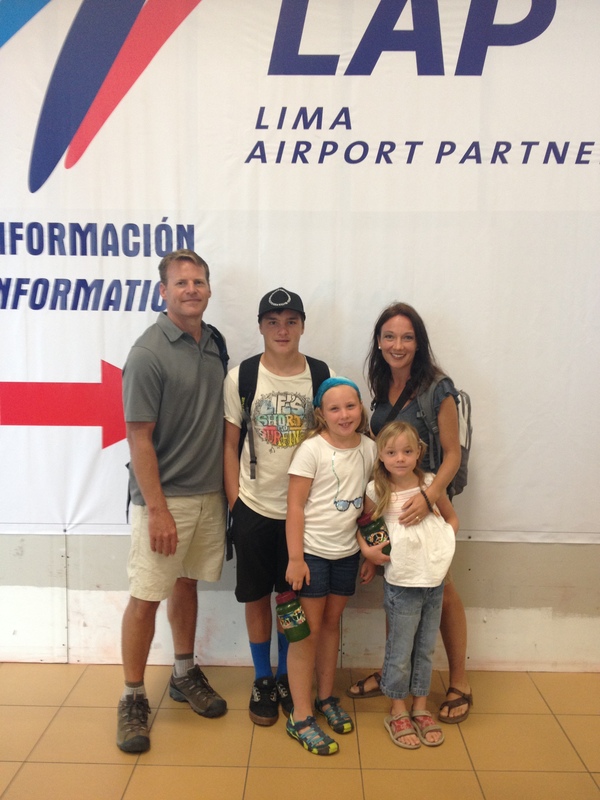 After finishing out a GREAT time in Lima, we started our journey south. Since our Brazil plans fell through, we made a connection in Paraguay. So we are heading that way with a few stops. 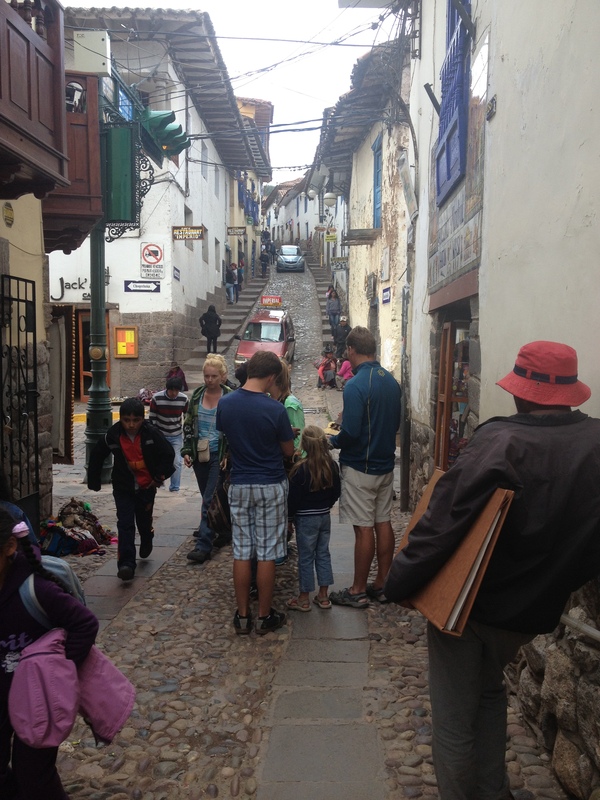 Our first stop was in Cusco, where the famous ancient city of the Inkas was found. People from all over the world visit Cusco to see Machu Pichu. (Due to time and money, we decided to do the whole Machu Pichu tour on a future visit.). But we loved exploring the quaint city of Cusco. It has cobblestone streets, fantastic architecture and many places to explore. We found a non-profit bakery helping at risk teens who are living on the street. The bakery was started by a French woman who wanted to help the teens by providing a place for them to stay and teach them the skill of baking. Unfortunately, The Yada Project has not figured out a way to import fresh bakery. We were happy to do our part of helping support the bakery while we were there…yum! Our next stop was a bus trip through the mountains to the city of Puno, located on Lake Titicaca. Lake titicaca is the largest lake at the elevation. On one end of the lake is Peru and the other side is Bolivia. We did a 2 day tour of the islands on the lake. The first island was a 2 hour boat ride to a man-made floating island. As far as we know, it is the only of its kind in the world. The floating island idea was started hundreds of years ago by feuding Indian tribes. The only way for the Aymara tribe to protect themselves was to escape to the lake and build a floating island. 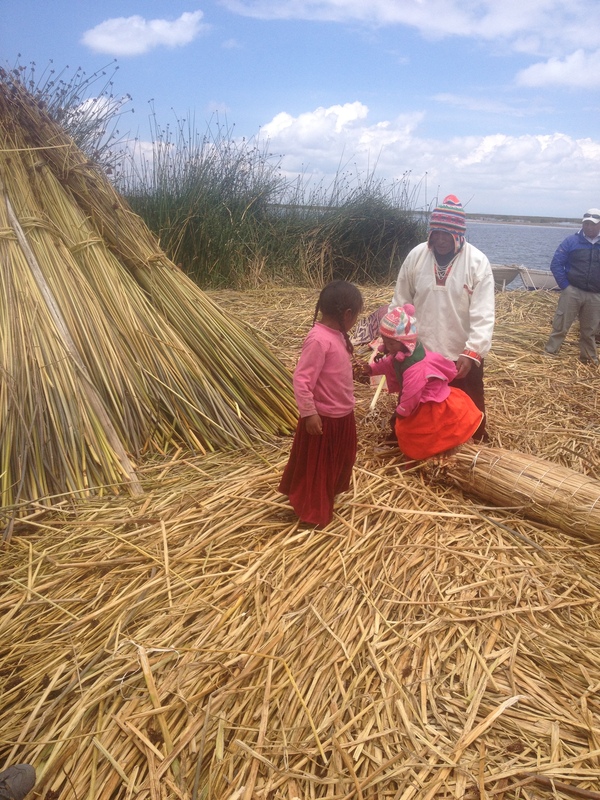 The island is made of reeds that grow in the shallow waters of Lake Titicaca. Stepping onto the island feels like you are walking on a waterbed. People still live on various floating islands and function similarly to how they did hundreds of years ago. Totally fascinating! 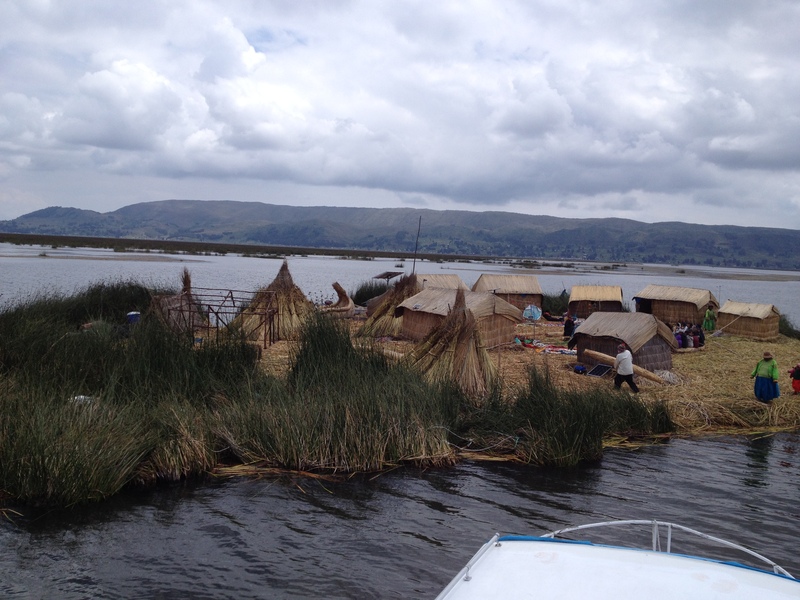 The next island was another 2 hours across Lake Titicaca, where we met a local Quecha family and stayed at their home. We had lunch and then hiked to the top of the island that allowed us to see into Bolivia. It was a magnificent view of mountains and the patchwork of crops grown on the island. This particular island is vegetarian, as they only eat what they grow. 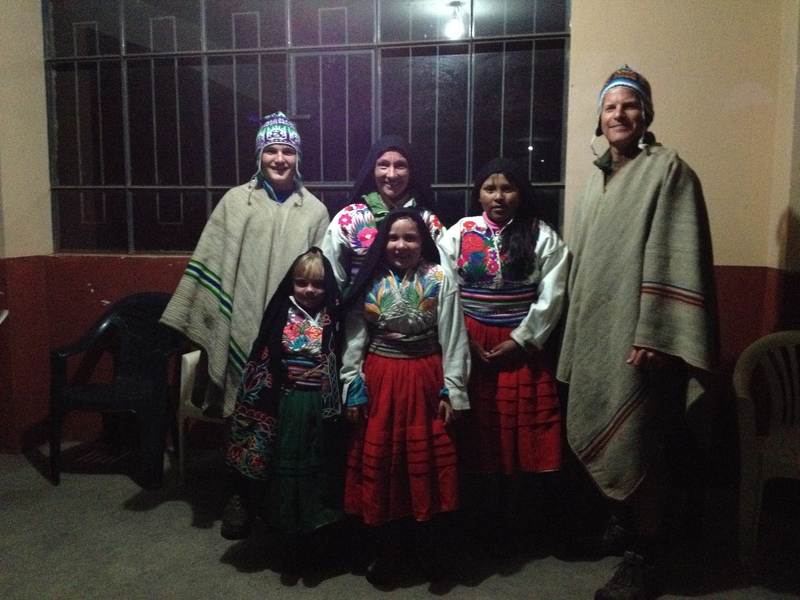 After our hike, we enjoyed dinner with our host family and then got to dress up in their traditional garb and to go a dance. Many if the local families arrived to teach all the “tourist” their dances. It was a blast, and quite a sight to see us all dressed in the Quecha outfits. We returned to our “home” and experienced life without running water and electricity. The next morning we boarded the boat for a tour of one more island. It was another great hike to the top and another step back in time to a place that has a different pace of life. In the midst of our 2 day tour, we had the chance to get to know the other passengers. We enjoyed hearing of others adventures (apparently Bolivia is NOT the place to stay in a hostal!). Eva made friends with a girl from Argentina that was traveling through Peru as well. We had a great time seeing Lake Titicaca. 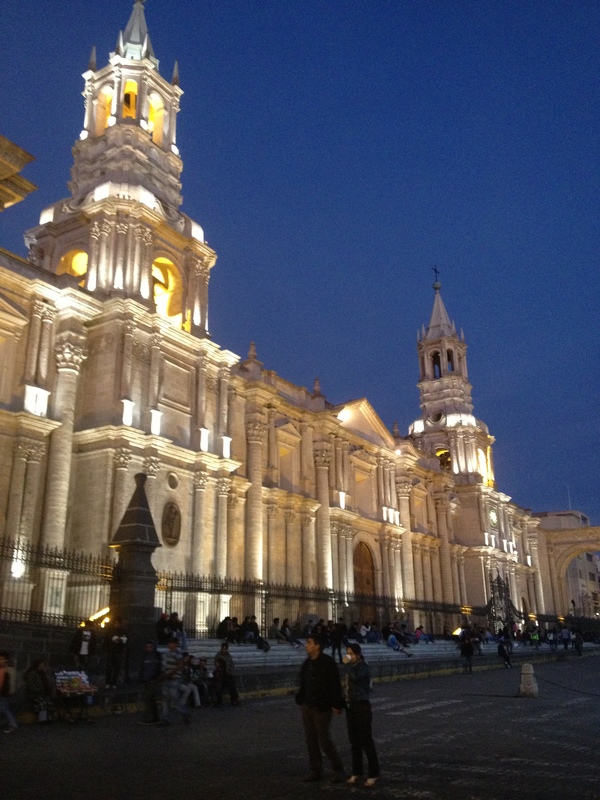 We then boarded an overnight bus to Arequipa. Arequipa is the second largest city in Peru, with beautiful volcanic white buildings surrounded by white capped mountains and volcanoes. We spent the day walking the streets and exploring their downtown. We are now heading out of Peru and traveling to Paraguay via Chile and Argentina. In fact, as I write this I am sitting on a non-air conditioned bus driving through the desert. I heard it is been a terribly cold winter at home, so I will not complain about being a bit hot. We expect to spend the next 40 hours or so traveling to Paraguay. We will update with our arrival or adventures enroute when we arrive! Where in the world are the Williams?! ?